Like most cranes, the beauty, grace, and dramatic ritualized mating dances of the blue crane make them iconic and popular birds in local cultures and lore. Their popularity in sport hunting and perceived threats to agriculture have caused populations to decline in most areas. Blue cranes are a robust species comfortable in a wide variety of weather conditions, so they may be seen on almost any day at the Zoo. They are a bit shy, especially during breeding season, so you may see some twig coverings on their boundary fence. It is easy to see through, but makes them feel more comfortable. 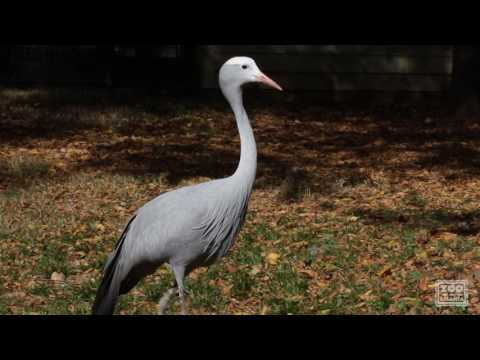 Also known as the Stanley crane, the blue crane is the national bird of South Africa. They have a distinct call that is loud, raspy and pulsed at a fairly low pitch. Like all cranes, they are diurnal, foraging, resting, preening and socializing during the day. During the day they forage, rest, preen, socialize with the flock and attend to their young during the breeding season. At night during the breeding season, cranes protect their nest and young from predators and other dangers. Outside of breeding season, they roost in large flocks at roosting sites in ponds, swamps and other bodies of water. Dancing is a common activity among most cranes, and it serves to help the young to develop physically and behaviorally. Mates dance to reinforce pair bonding, and single birds dance to promote pair formation. Some dances during courtship have been observed to last anywhere from a half hour to as long as four hours. Blue cranes are a uniform bluish-grey, becoming darker on the upper neck. The crown is white. The lower half of the crane’s head and nape where the feathers are longer and thicker give the bird a cobra-like appearance. The tail is black or nearly black and is hidden under the ornamental secondary wing feathers. The wingspan may approach seven feet across. In the wild, these birds may live longer than 40 years. During the breeding season, cranes are isolated on their territories with their mates. Breeding season takes place during the summer months, and a clutch of one or two eggs is laid. The nest is often built in pastures, fallow fields and in recently-harvested crop fields. Once the chicks have matured, the adults and their respective offspring will form flocks with other groups in the vicinity. The offspring will then seek other offspring from within the flock to ultimately find a mate. Blue cranes live in southern Africa, including South Africa, with an apparently isolated population in Namibia. These cranes live in open grasslands and semi-deserts, and they do make use of human-made pastures and agricultural fields. In the wild, these birds forage on their long legs through grasslands looking for small animals such as insects and frogs, as well as seeds. At the Zoo, we offer grain mixes, crickets, mealworms and peanuts.